Today I attended the second sustainability society meeting in which we discussed current progressions with the various tasks and initiatives the society is involved with developing. Green space proposal was passed! training workshops for gardening opening soon. Promote any ideas on society FB page. Funding is now needed for expenses - Bobby involved with achieving. Scrap - Retailer for scrap/old unused materials. Membership is £6 allowing you access to cheap reused materials. Society blog is currently being constructed. Blog will list sustainable suppliers for materials and tools. Society is looking to brand out and interact with the other existing societies. Considering producing a booklet detailing college relevant sustainability statistics and information on the society. Would be distributed to freshers. Booklets production will need to be sustainable - Inks & Stock. Seagull paints - retailer for old paints in Leeds. The Arts Party are creating a sustainability focused brief with exhibition outcome. 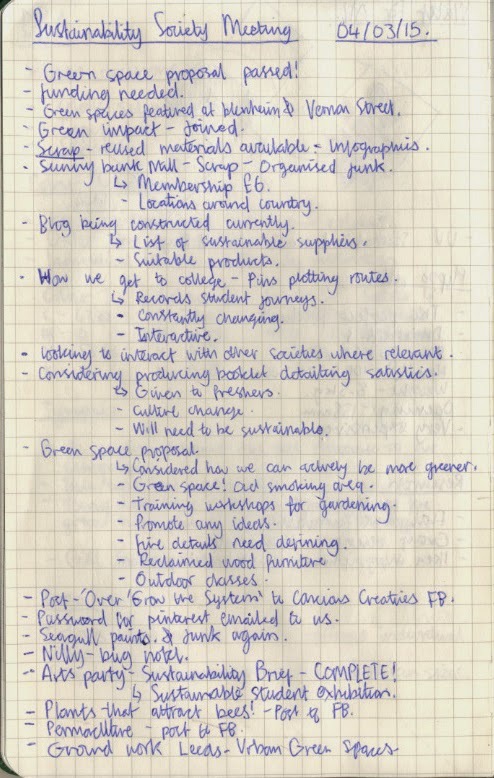 Additional to the notes taken during the session I also created a list of progression points detailing small tasks I can complete to engage more with the society while simultaneously helping to develop ideas and concepts. Post 'Over Grow the System' to society FB page - Relevant information. Post information on 'Permaculture' farming/gardening to FB page - Relevant information. Brain storm ideas for green space.